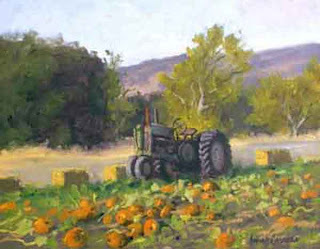 I was drawn to this image of this old tractor with the pumpkins in the foreground. It has a timeless quality to it. Because this was on private property I first asked permission to paint there. 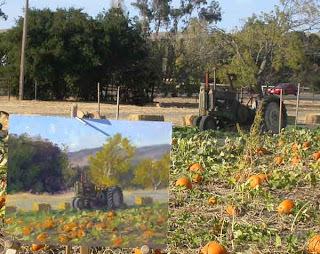 The owner was very accommodating and allowed me to go ahead and set up and paint. I set up and chose an 11×14 panel. 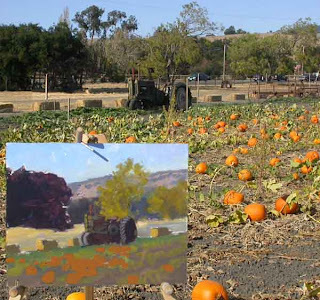 I wanted the tractor to be the main focus with the pumpkins leading you into the painting. 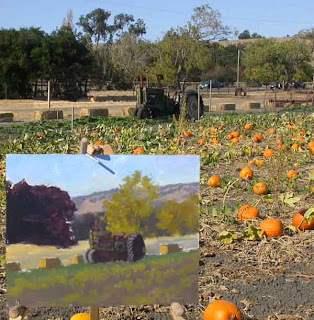 I started by massing in the main areas of the painting with some perspective lines for the foreground. I am careful to get the value of each area correct. These flat poster-like shapes of value are what hold the areas together and will still be visible in the finished painting. I work large to small so once the main shapes are established I begin to model the smaller areas and forms within the big shapes. I look for hue, temperature and saturation changes as opposed to more value changes. Most of the time painters break up the initial value pattern with too many value changes, this fractures the over all composition and weakens the paintings unity. To avoid this I constantly check my choices comparing their relative color and value and size against the rest of the established areas. 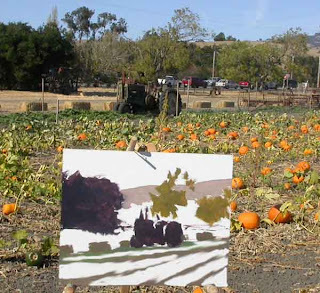 I’m ready for the pumpkins; I begin with a mid-tone color for their group mass and then model the pumpkins forms add some more modeling to the vines and tilled ground. I now soften edges throughout the painting where appropriate. Did you start with a color scheme in mind? No specific color scheme other than natural color. Just tried to capture what I saw. 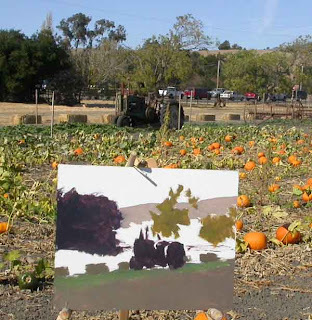 This painting was done with a limited palette of three colors and white; cadmium yellow, alizarin and ultramarine blue.